Poll results from Gallup and Castelli on what Americans believe about the afterlife uncover some interesting trends. More Americans believe in an afterlife than they believe in God. In general, Americans believe in a kinder, less-judgmental afterlife, an ideal state in which American values of family, work, and progress are uppermost. Nearly all American Christians expect peace, tranquility and reunion with relatives. The notion of hell is gradually disappearing even in mainline churches and few outside rightwing Christians take hell seriously at all. The orthodox doctrine of an apocalypse and resurrection that Jesus and Paul taught is now preached only within conservative religious sects. Instead the immortal soul is now the center of focus. The immortal soul philosophy comes from the teachings of Greek intellectuals and it was in Greece that Christianity first took hold. First generation Christians expected the Second Coming and the apocalypse to take place within their lifetimes. In light of the failure of either to occur, the immortal soul concept was eventually synchretized with Christian beliefs some three hundred years later. As I discuss in The Last Frontier, Old Testament statements about the afterlife are few and contradictory. The history of the afterlife in ancient Judaism includes a very early belief in Sheol to outright denial in later centuries before Christ. Given this problematic inheritance, Jews are more likely than Christians to imagine a nonpersonal existence. One half of Jews but only one fifth of Christians imagine a “vague” existence after death, meaning that they expect to lose their earthly identities. On the other hand, the long-defunct belief in Sheol is experiencing a comeback. The following poll results from Gallup and Castelli of what Americans believe is based mostly on Christian responses. The afterlife will be a better life and a good life. It will be happy and joyful. There will be no more problems or troubles, no trials and tribulations. Worries and cares will vanish, along with sorrow. There will be no more sickness or pain. 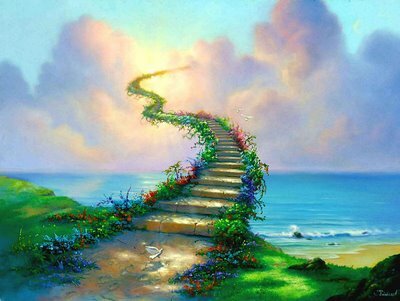 The afterlife will be a spiritual experience, not a physical realm. It will be peaceful. Hell is really on earth. Those who make it to heaven will be happy. They will be in the presence of God or Jesus. There will be love among people. God’s love will be the center of life after death. The crippled and the maimed will be whole. People in heaven will grow spiritually. In heaven they will reunite with friends, relatives, and spouses. They will minister to the spiritual needs of others. Those in heaven will be recognizable as the same people that they were on earth. There will be angels in heaven. Significantly, few of the descriptions of heaven depict explicitly Christian doctrines. They reflect rather American values as they are held today. The first descriptions of the afterlife concern personal and familial happiness. Then respondents express the importance of work, of accomplishments, and of caring for others. Such priorities would have been unthinkable, if not distasteful, in earlier places and times. American ideals of a positive growth, positive development, and continuous education are deeply enshrined in our contemporary notions of what is unfortunately mostly referred to as heaven. Polls also indicate marginal beliefs that range from literal resurrection of the body, to deathless existence on flying saucers in the stars, to nothing specific beyond the confidence that the afterlife will be enjoyable.